Lightly butter 13 x 9-inch (3-quart) baking dish. In medium bowl, beat cream cheese, 3 tablespoons of the sugar, and 1 tablespoon of the lemon peel with electric mixer on medium speed until smooth and creamy. Generously spread mixture over 5 slices of the challah. Press a few blueberries onto cream cheese; place another slice challah on top of each to make cream cheese and blueberry sandwiches. Place 4 of the sandwiches in baking dish. Cut remaining sandwich into pieces to fill in any gaps between the ones already in the dish. In large bowl, beat eggs, remaining 3 tablespoons sugar, remaining 1 tablespoon lemon peel, the milk and cream with whisk. Pour mixture over challah in casserole; top with remaining blueberries. Cover with plastic wrap; refrigerate at least 1 hour but no longer than 12 hours. Take dish out of refrigerator about 30 minutes before baking to take the chill off. Heat oven to 350° F. Bake about 40 minutes or until puffed and golden. Cool on rack 15 minutes before serving. You can bake this French toast after an hour or so of soaking, but overnight is best and makes for an easier morning. 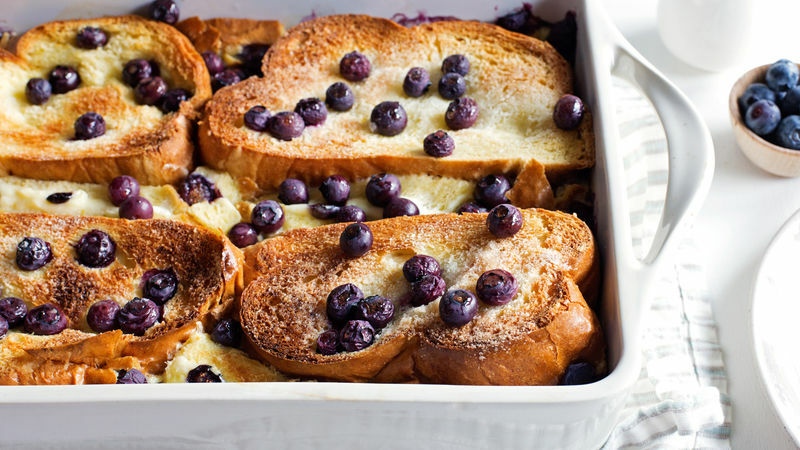 This French toast would be delicious with raspberries or blackberries in place of blueberries. Frozen would work great, too.